This will be followed by an energetic performance of Rajasthani Sufi- Folk music by the Manganiyars, led by Mame Khan and Group (GIMA Awardees). Manganiyaar means “those who ask for alms”. These hereditary caste musicians traditionally performed for kings and lords on various occasions ranging from weddings to festivals to even mourning events. Their music fuses elements of Hindustani classical music with the Sufi music; the lyrics are mostly centred around life and the love for God. 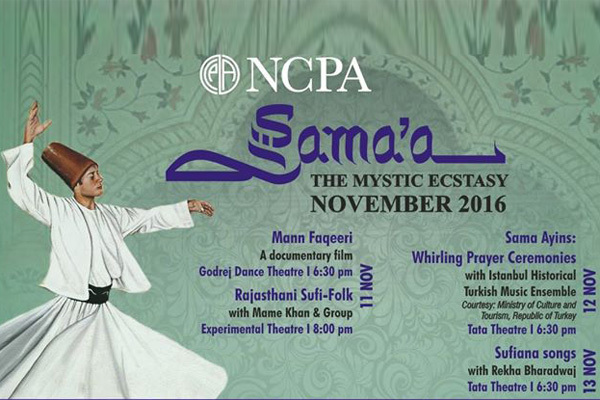 The presentation will include works of Sufi poets from Sindh and Rajasthan, including Mira Bai, Kabir, Bulleh Shah and Baba Ghulam Farid, in their own mesmerizing style called ‘Jangra’ with native musical instruments like kamaicha, khadtal and morchang. Mame Khan hails from a family of singers based in Jaiselmer region and gained popularity with his super hit renditions in Hindi films like No one Killed Jessica and Luck By Chance. kanun (box zither) followed by the prayer ceremony. Istanbul Historical Turkish Music Ensemble was established 1991 by the Turkish Republic Ministry of Culture and Tourism with the intention to preserve and promote the 700 years old traditions of Turkish Tasawwuf music and traditional Sama Ayins (Whirling Prayer Ceremonies) in their original form. The third day is a rendition of contemporary and popular Sufi songs by the versatile Rekha Bhardwaj, which will transcend the artificial boundaries of religion, caste, country etc. The core idea of love, longing and union with the beloved, as espoused in the Sufi songs has an evergreen appeal with people from all of walks life. Today, besides the traditional repertoire a large number of songs are sung under the Sufi label. These compositions show a marked influence of contemporary idioms and expressions, and are widely popular with the masses. Rekha Bharadwaj’s presentation will include a bouquet of sufiana compositions from traditional repertoire and also songs based from Bollywood. The artist is a very popular singer who has trained with several stalwarts like Vasant Thakar, Vinay Chandra Mudgal and Amarnath ji of Kirana gharana. She has lent her voice to Hindi cinema in films like Delhi 6, 7 Khoon Maaf and Ishqiya which won her two Filmfare awards and a National award.